Okinawa’s governor has demanded flights of all Osprey tilt-rotor aircraft be suspended following a deadly crash in Hawaii, as public concerns over the further deployment of the aircraft in Japan gain momentum. “From the (Okinawan) residents' point of view, Osprey deployment is not acceptable to begin with,'' Governor Takeshi Onaga told a televised news conference, as cited by AP. He said he plans to demand the US military suspend all Osprey flights until the causes of Sunday’s crash at Bellows Air Force Base in Waimanalo in Hawaii are investigated. The accident killed one and injured 21 others on board. 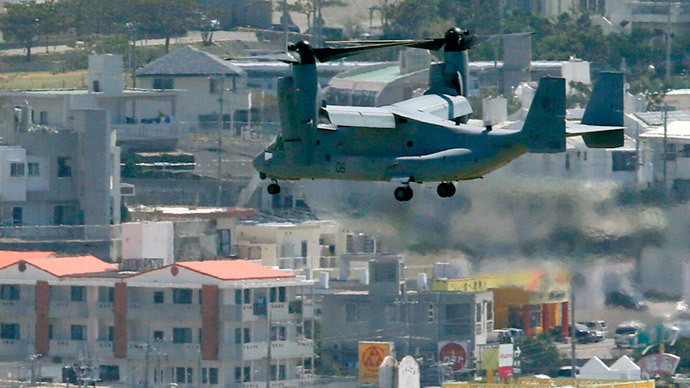 The crash of the MV-22 Osprey, a loud tilt-rotor aircraft, renewed safety concern among Okinawa residents. "I worry that we don't know when an Osprey flying overhead might go down in a residential area," Chieko Oshiro, a 61-year-old resident near the Marines' Futenma Air Station in Ginowa, told Kyodo News. The accident occurred just a week before Onaga plans to visit Washington in a bid to stop the planned relocation of the US base in his prefecture. He said he hopes to speak with members of Congress and the Defense and State departments. Before going to Washington, the governor plans to visit Hawaii. The US operates 24 Ospreys, both MV-22 (such as the one that crashed in Hawaii) and CV-22 (that has proved to be significantly controversial) on Okinawa. Japan announced last week that it would let the US Air Force deploy a number of CV-22 Osprey aircraft at an airbase in western Tokyo from 2017. Thousands have been marching in Okinawa and across Japan since Friday in protest against the planned relocation of a US military base in Okinawa. The protesters criticized the Japanese government, who appear to be turning a deaf ear to the locals. On Sunday, the march gathered about 35,000 people in the prefecture that hosts nearly half the 47,000 US troops based in Japan. The US Marine Corps’ Futenma Air Station, in heavily populated Ginowan city, has been a cause of tension between American troops and locals for decades. Tokyo wants to shut the base down and open a new one in the more remote town of Henoko, in the center of Okinawa. However, the majority of local residents, as well as Onaga, want the construction of the replacement base to be scrapped. In March, the Okinawa governor demanded the underwater survey needed to build an offshore airstrip for the new base be stopped, citing environmental damage. Onaga met Defense Minister General Nakatani in May to discuss the relocation plan. However, they failed to reach a solution.